I learned that in a profession surrounded by women Nick shared, "he only saw her." Shanon shared that their friendship; and a Rockies game first date quickly turned into true love when she was least expected. A beautiful friendship, a beautiful love story. I was inspired by the idea that ten years had brought so much to the lives of Shanon and Nick. As they were sharing their story, it already resonated with me this couple was ten years of smiles. I could see it on their faces and in their words spoken from the heart. In ten years they had also built a life with one another. They shared a sense of humor and a passion and excitement for life. Shanon described Nick as the person she loved spending time with. His dreamer nature make her more open to try new things. To her, he is spontaneous, funny, and a little bit crazy :) And all of these things make Nick “the one” for her. Nick described Shanon as the person who understands him. Her nature keeps him grounded. To him, she is the simply the perfect girl, his best friend. And, they surely shared a passion for their hometown football team! Per a superbowl bet, Nick was allowed to wear his Broncos orange tie when he walked down the isle. Inspired by their sense of humor, their ear to ear grins and their light-hearted ways I tested out some incorporation of humor throughout their ceremony. Sports humor. I had to be sure they'd hold up those vow even if the Broncos didn't make it to playoffs, or if their fantasy football teams went head to head :) And, they promised, their guest laughed and so we exchanged rings. In speaking with a loved one, I learned that they were defined by their ear to ear smiles, the way the complimented one another, the way it was so obvious how much they loved one another when they looked at one another. Their wedding ceremony was uniquely them. When they came together they carved out a friendship that was simply very honest, so comfortable and trusting. 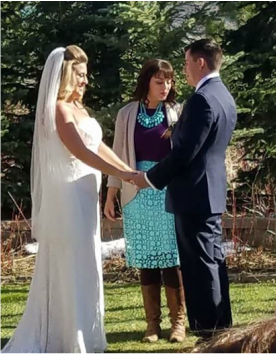 On this day, a beautiful sunny Colorado day we carved out a beautiful way to honor this couple. Their ceremony lingered into the gorgeous foothills, filling the serenity of the mountains with themes of smiling and having fun with one another, understanding one another, and balancing one another. I will remember this wedding for the laughter, Shanon and Nick's beautiful spirits uniting with one another. I will remember the way Shanon barely could get through her vows, so emotional. The way Nick smiled arm and arm with his mother about to walk down the isle. And the tearful laughter that filled the air. And, that is what people will remember. Not the food they served, not the rustic wildflower center pieces. They will remember that their day was uniquely them. It was true, genuine; it was Shanon and Nick. Well and as we can by the Bronco’s orange Nick is wearing around his neck; these two surely shared passion for sports! And… I sense it’s important that I ask this…. do you promise to love one another, even during football season? Like if the Bronco’s don’t make it to playoffs? Or if your fantasy teams go head to head? Nick, I give you this ring as a symbol of my love and faithfulness. With this ring, I give you my all. Let this ring be a reminder that I am always by your side. I promise to forever be your partner and friend. Loving you and smiling with you each day. Having you in my life makes me whole. Ten years this week actually.